Howard Holschuh’s newly released “Helen, Dearest” is the autobiography of a retired Navy Captain who served in several postings around the military until retirement. “Helen, Dearest” from Christian Faith Publishing author Howard Holschuh is the collective memories of the author, a retired US Navy captain that served during some of America’s most testing times. This book also shows the love that would help get the author through the years. “Helen, Dearest”: a story that is told largely through the exchange of letters, is a romance and how the author got through the trying times of a world without peace. “Helen, Dearest” is the creation of published author, Howard Holschuh. Howard and his wife Helen met on their first day at Westminster College on September 28, 1941, and began a romance which was to last for 65 years. However, the Japanese bombing of Pearl Harbor a few weeks later put their plans on hold. He joined the Naval reserve, received a commission in the Navy, and served on a troop transport in the Pacific Ocean. His duties included taking occupation troops to Japan. 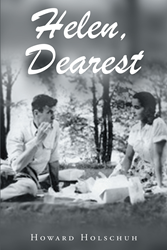 This novel “Helen, Dearest” is based on the letters Howard and Helen exchanged during the five years he served in the Pacific and elsewhere. Published by Christian Faith Publishing, Howard Holschuh’s new book is the autobiography of a retired US Navy Captain who served during some of America’s most tumultuous years from World War II until retirement in 1972. Alongside tours for the service is the story of a young couple trying to navigate through the struggles of the time to be together. Despite the trying times, the couple survived and now the retired Navy captain’s life is on display for others to learn from. View a synopsis of “Helen, Dearest” on YouTube. Consumers can purchase“Helen, Dearest” at traditional brick & mortar bookstores, or online at Amazon.com, Apple iTunes store, Kobo or Barnes and Noble. For additional information or inquiries about “Helen, Dearest”, contact the Christian Faith Publishing media department at 866-554-0919.